The Fleming conference “Sales & Marketing Effectiveness in Chemicals Forum” is coming to Cologne in just a couple of weeks’ time! This must-attend event for anyone working in Sales or Marketing in the Chemicals industry will take place on the 25 and 26 October at the Pullman Cologne Hotel. The theme for this year is “winning the customer experience battle” – a topic close to our hearts as CX research specialists. 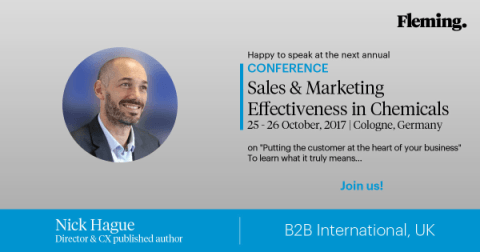 Given the importance we place on customer experience at B2B International, we’ve ramped up our involvement for this year’s event. As well as being a ‘Silver Sponsor’, our very own Nick Hague will be appearing as one of the expert speakers. Nick’s talk – “Putting the customer at the heart of the business” – will start at 11:40 on Day 1 (25 October). He will outline how to use CX as a differentiator in an undifferentiated market, how to develop a best practice CX programme, alongside a case study emphasising how to align a global company around service excellence.